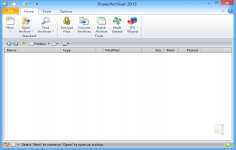 PowerArchiver is a powerful archive utility that can compress and decompress a large number of formats: 7z, ZIP, CAB, LHA (LZH), TAR, TAR.GZ, TAR.BZ2, BH, RAR, ARJ, ARC, ACE, ZOO, GZ and BZIP2. It protects archives with passwords and it can also be verified by an antivirus. It also manages XXE and UUE encoded files and can also create self-extracting ZIP files, RAR, ACE, ARJ, LHA and BH. An interesting feature is that it allows to decompress multiple files simultaneously. PowerArchiver also adds extensions to Windows Explorer to extract an archive in the current directory as the name of the subdirectory of the archive (for example C: softwarearchive.zip becomes c: softwarearchive). Curently we don't have any log information about PowerArchiver version 18.02.02. We will this change log update soon!